The Lunt Solar Systems LS80THa/PT is a complete and dedicated solar telescope. 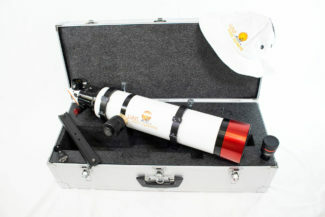 A precision aligned ED refractor with a fully un-obstructed 80 mm optical aperture, this package provides a significant step up into the intermediate category of solar observing. The LS80THa/PT (PT = Pressure-Tuned) maintains the most advanced technology of Doppler True Tuning for fine adjustment of the center wavelength, allowing research of the Sun’s disk and surface details at increased image scale. Prominences, flares, super granulation, filaments, and active regions will be observed. True Doppler Tuning allows for a shift into and away from the user, adding a 3D-like component to the viewing experience. While it has minimal effect on proms due to their location at the edge of the disk, it does have an effect on filaments and active regions on the surface. While looking at a filament at the center of the Sun, the user has the ability to Doppler shift from the base of the filament to the tip, following the filament through it’s structure toward you and away from you, allowing for enhanced visual and imaging capability for the observer as well as a research tool for the avid hobbyist. The pressure tuning system provides an order of magnitude more precision to the tuning of the desired features. The LS80THa package is fully upgradeable with several options, including the evolutionary Dual Internal Stack Etalon System (DSII). The DSII eliminates the need for an external doublestack etalon, reducing cost and eliminating obstructions. The system is 100% un-obstructed. The bandpass is reduced to <0.5 Angstroms, allowing you to see the Sun’s weather in stunning high definition. The image above shows the LS80THa/PT with the optional DSII installed. No Blocking Filter Warning – only choose this package if you already have a Lunt Solar Systems blocking filter at your disposal. All Lunt Solar Systems h-alpha telescopes require a Lunt Blocking Filter!